As of Windows 10 v.1809, for the regular end-user it is now recommended to wait until Windows Updates are offered so that the updates are stable. “Patch Tuesday” or Update Tuesday updates are published on the second Tuesday of each month. They are known as the “B” release . They are the regular monthly releases that include both new security fixes and previously released security and non-security fixes. These updates have been fully tested and are expected to be stable. Optional non-security validated, production-quality “C” and “D” updates are released at Week 3 and 4 each month. They are for commercial and advanced users for testing fixes to be included in the next Tuesday update. Advanced users can obtain the “C” and “D” releases by navigating to Settings > Update & Security > Windows Update and clicking the “Check for updates” box. Bottom line: If you use “Check for Updates” you may be offered “C” or “D” updates. Unless you are an advanced user and are interested in testing, wait for the regular “Patch Tuesday” or do it during Week 2 for “B” fixes. Windows 10’s feature update 1809 was rolled out on October 2 but was stopped on October 6th after some major problems. It was re-released on November 13 and is being sent to Windows 10 users in phases, so it might be some time before you see it arrive on your computer. It is the company’s sixth feature update since Windows 10 was released in 2015. The new Clipboard can keep multiple clips, store clips permanently, let you preview clips and choose which ones to paste into a document, and share clips across Windows 10 devices. *To enable this feature: Go to Settings > System > Clipboard and toggle on both Clipboard history and Sync across devices. *To copy to the Clipboard highlight what you want to copy and press Ctrl + C, or use an application’s menu, such as Insert > Copy in Office applications. Another way would be right-clicking an image on the web and selecting Copy Image from the menu that appears. * To view Clipboard history, hit Windows key + V.
* To clean off the Clipboard, clips can be deleted individually or deleted all at once. With 1809 users will get a more unified dark color scheme throughout the OS when you opt to turn it on. Enabling it can be done by going to Settings > Personalization > Colors and select Dark under the Choose your default app mode section. Edge includes a new sidebar Options menu for organizing Favorites, Reading list, and History. There are also improvements to Edge’s built-in PDF Reader and several other performance improvements. Edge users will now be able to stop autoplay videos, music, and other media. The favorite Screen Snipping Tool will be improved and will now be called Snip & Sketch to combine the Snipping tool with Windows Ink Workspace into a modern experience. That will enable users to take a screenshot and immediately edit and annotate in order to share the shot within the same interface. 1809 will include recent documents, tasks, quick answers from the web, and more. The user interface (UI) is also wider and allows easier access to info and other items. Storage Sense automatically cleans your hard disk to free up disk space. In the Windows 10 October 2018 Update Storage Sense works with OneDrive Files On-Demand to clean out files that you don’t use on your local PC. In order to use Storage Sense go to Settings > System > Storage and move the slider in the Storage Sense section to On > Click “Change how we free up space automatically”. Scroll to the “Locally available cloud content” section. In the OneDrive section, select the time period for how long you would like the cloud files to remain on your computer before you want them deleted ( Never, 1 day, 14 days, 30 days or 60 days). For Android owners after linking a phone to Windows 10, they will be able to share web links and sync texts and photos between their phone and computer. Pictures will automatically sync when the phone and PC are connected. Fewer features are available to iPhone users because of Apple’s platform restrictions. While Android users will benefit most, iPhone owners can send links from the Edge iOS app to open on Edge on their PC. Phone owners will see a shortcut to this app on their desktop. In October 2018 Windows Update servers will begin delivering Windows 10 version 1809 to current installations of Windows 10 that have been running for at least 30 days. Each time there is a feature update, Microsoft adds and/or removes other features. Click Settings > System > “Change how we free up space automatically”. This will open the Storage Sense settings on your PC. Simply turn it on so that it will be ready to use. The Snipping Tool, a favorite of many, has been replaced by the Screen Sketch Tool which includes support for freehand screenshots as well. There will be a shortcut in the action center for this. There are no devices which now support this technology. This was a function of Windows Server 2008 R2 were devices which could scan, where integrated into the document workflow of an organization. The mention of FontSmoothing in the unattend.xml file will be ignored. It is not necessary because Windows 10 now uses ClearType. Previously, this was used to specify whether font smoothing is enabled, and which type. The Hologram app is used to view the 3D paintings created using Paint3D. Windows 10 uses the Mixed Reality Viewer instead. Microsoft has moved their Device and Security to Windows Defender. The information which was previously available through TPM console, can now be seen in the Device security page in the Windows Defender Security Center. This tool was used to access TPM for Azure connectivity. It will be open source now so that other developers can meet the needs of users who may want it. All the features that were available with the Phone Companion App will be available in a new Phone Page App. The WEDU update server will stop pushing new updates. Therefore, updates for Windows 8 Embedded version, will need to be manually downloaded from the Microsoft Update Catalog. Microsoft has also stopped developing Companion device dynamic lock APIS and OneSync service because their functionality is now available in other Windows 10 components. 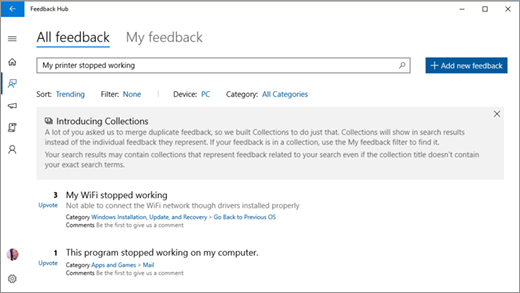 If you have feedback about the proposed changes, you can use the Windows 10 Feedback Hub. What Is Windows 10 Feedback Hub and How Do I Use It? Feedback Hub for all users of Windows 10 is a communication tool included in the Windows 10 operating system as of the 2016 Anniversary Update. Feedback Hub is the combination of a previously released Windows Feedback app and the Insider Hub for Windows Insiders. Currently, the app is available from the Microsoft Store for anyone to install. A Microsoft account and an internet connection are required to use Feedback Hub for full functionality, but once those requirements are met, the Hub can be used by anyone running Windows 10 or Windows 10 Mobile. This allows everyone to submit feedback to the Windows team at Microsoft. An “Enhanced” setting permits a user to send verbatim feedback. A “Full” setting allows the user to send diagnostic information in order for Microsoft to diagnose a specific problem on an owner’s device. The Hub’s forum type feature not only includes a feedback board for submitting suggestions and problems, but also provides announcements on new Insider Previews of Windows and apps, “quests” for testing new workflows, and a dashboard for tracking achievements in the Feedback Hub. The home view shows a search box for feedback, a count of feedback provided and upvotes received, a list of new features, options for rating the Windows build the user is currently using, and links to a user’s profile and external information about Windows and the Windows Insider Program. A user will have the ability upvote and comment on ideas from other users as well. The Feedback hub not only also provides news and gives users the opportunity to rate Windows 10 builds, but it includes ways to complete feedback quests, and to earn badges. 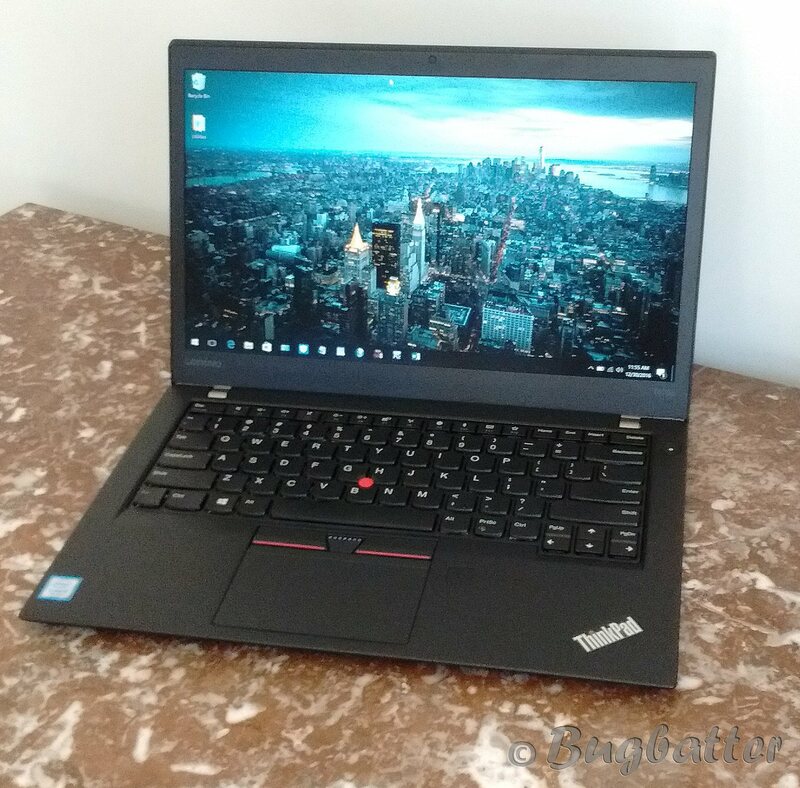 This review is for the ThinkPad X1 Carbon Gen 5 that I received for my participation in the Lenovo Insiders Program. I have not had an X1 in a few years so I was anxious to become re-acquainted. The model that I received is ThinkPad traditional black. 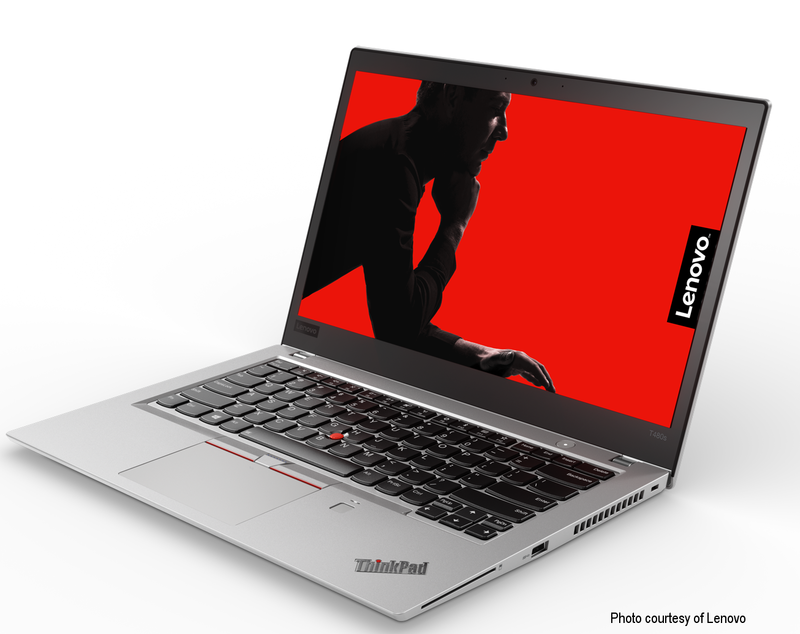 Silver is also available from Lenovo Sales. In comparison with my other ThinkPads, the X1 Carbon is the thinnest and lightest one that I own at only 2.49 lbs. In the short time that I’ve used it, as I’ve traveled around the state with it this model has been extremely portable and comfortable. 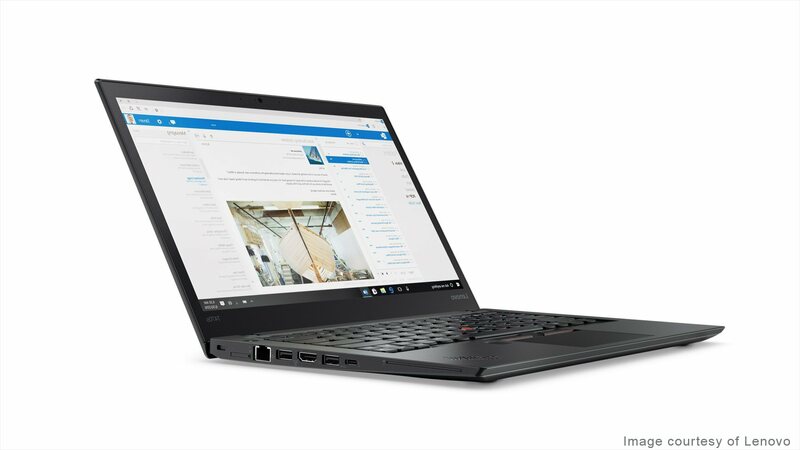 Yes, those are military specs because the X1 Carbon is designed for businesses. Could I stand on the X1C? Probably, but I’m not going to try it because I don’t believe in abusing anything that Lenovo sends me. I’ll leave that up to the pros whose job it is to put laptops through rigorous testing. One plus that I appreciate is the backlit keyboard. Even though my desk at home is by a window, as dusk settles in I very often find myself so focused on what I’m doing that I need the backlighting to get me to a stopping point in a project so I can get up and turn on a light in the room. As mentioned above, this unit’s display is 1920 x 1080 . My personal preference would be a better resolution. I do quite a bit of artwork as a designer of smartwatch faces, so I need a bright display with clarity and details. I am wishing that the resolution on this X1C could be a bit better. It serves the purpose, but if I were going to order an X1C, I would opt for an upgraded display. Having said that, I feel that the many pros outweigh the cons on this one, so I would not hesitate to recommend it to others. 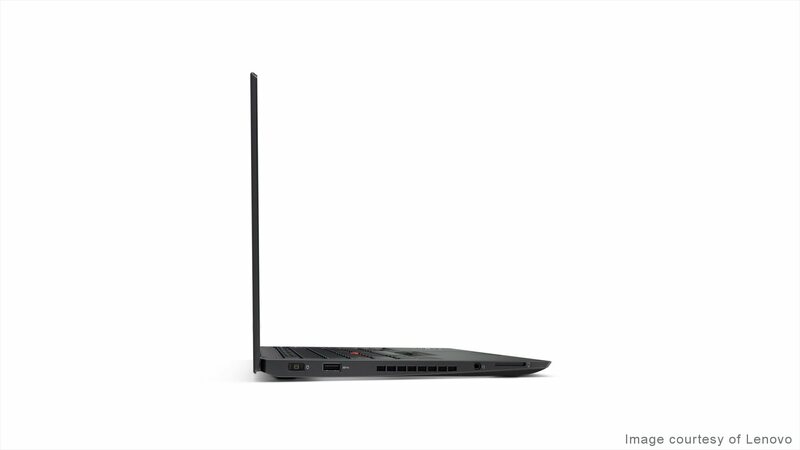 Whether for business or for the home consumer, the X1 Carbon Generation 5 definitely deserves a thumbs up. Disclosure: Lenovo sent me this product as part of the Lenovo INsiders program and did not provide additional compensation. All opinions are my own. If you are experiencing issues with your Windows 10 computer and have been looking for help, this article offers several built-in support options and online resources that are available. For Windows 10 you will find most of your support online. 1] Clicking on the Fn+ F1 key will normally start your default browser offering you Bing results about Windows 10 Help.2] Typing help in taskbar search will display the Get Started app in its results. 3] For best results be sure that you have configured Settings > System > Notifications & actions to ON for the Show me tips about Windows choices. 4] Optionally the taskbar search bar or Ask Cortana is available to search online for help. 5] The built-in Contact Support App can open a chat session with a support agent or set up a call-back with Microsoft. This should be one of your first steps to obtaining help from Microsoft. 6] Microsoft Customer Service also provides another way to contact them by virtual chat. 8] Microsoft provides a Disability Answer Desk for customers with disabilities to find support with Microsoft Office and Windows including product Issues, accessibility questions, and use of assistive technology . Telephone, video phone and chat options are offered on this page. 9] Microsoft Support’s Official Twitter Account is @MicrosoftHelps. 10] It is also possible to obtain help from the Microsoft Store if you have one locally or online at https://www.microsoft.com/en-us/store/locations/answer-desk. The page includes some paid options as well. Microsoft Diagnostic Tool (MSDT) is used by Microsoft Support to help diagnose Windows problems. Microsoft Product Support Reporting Tool facilitates the gathering of critical system and logging information used in troubleshooting support issues. This information helps to diagnose problems in the software quickly so that a solution can be provided. Microsoft Easy Assist allows Microsoft Support Agents to remotely connect to your computer in order to assist you. Using a secure connection, the support staff member can view your desktop, perform diagnostics, and initiate troubleshooting steps in a timely manner. 12] You may also find information pertaining to Windows 10 on community forums provided by the manufacturer of your device (Asus, Dell, Lenovo, HP, etc.). *Choose a great title – Please use descriptive titles when starting a new discussion – at minimum, these should include the model of phone and the symptom or issue…. If you prefer to simply explore the boards, in your search remember to use specifics such as the error you receive and your system’s model name. Most likely you will find a related discussion or helpful Knowledge Base Article. For example, Lenovo’s Knowledge Base is HERE. 13] In addition to the forums, the brand or OEM may provide a support page where customers can find drivers and other downloads for hardware and other information such as product security advisories. 14] Finally, if you opt to call the tech support line provided by the manufacturer of your device, depending on the type of support that you arrange, an agent may be able to remotely access your computer. If your warranty contract provides for on-site support, you may be asked to use that option. Make sure the business that you are contacting is the actual support line provided by the manufacturer. With the availability of all the above resources and a little time, everyone should be comfortable looking for help with Windows 10. Considering its compact size, compared with other brands’ older models that I’ve owned, this dock would be fairly easy to travel with for anyone needing to connect mouse, network, power, printer, and other peripherals. 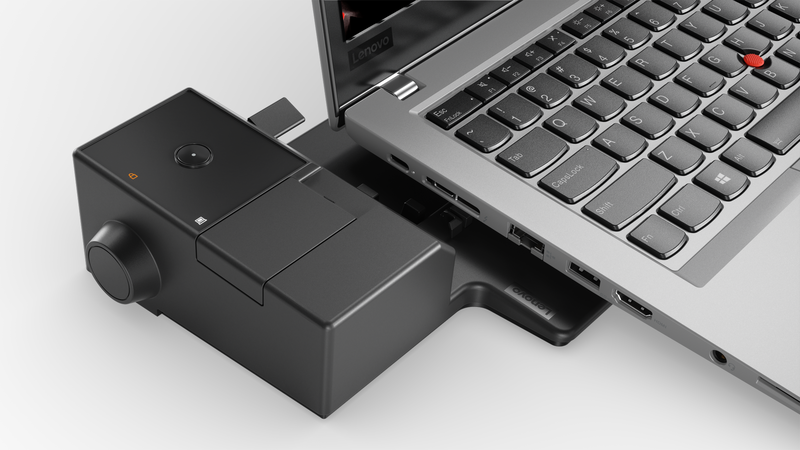 Similar to older Lenovo Pro docking stations, a lock is also included. As to the T480s ThinkPad, it is the first unit that I have received with a pre-installed version of Windows 10 Pro with the Fall Creator Update (v. 1709, Build 16299.125 ). I was curious to see how this compared with my other devices that are simply using manually updated versions of 10. 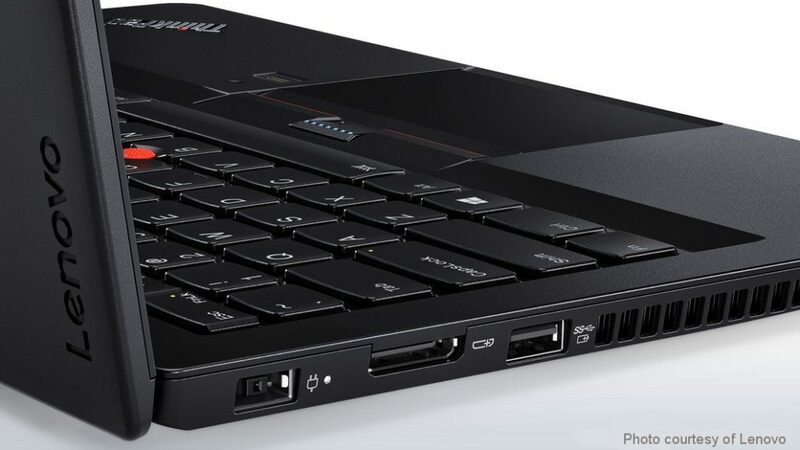 The exterior of the T480s is dark silver — almost a graphite color. It is also available in the traditional black. One nice thing I’ve noticed so far regarding the dark silver exterior, is that the paint seems to be more durable than the silver paint on my Lenovo YOGA 900 that has scratches on the bottom that were caused by my moving it between various surfaces. As I was attempting to seat and secure the ThinkPad in the dock I wondered if the paint on the bottom would show any marks, but much to my surprise it’s still as clean as when it was unwrapped from shipping. Battery: Preliminary marketing specs for the T480s show up to 13.5 hours. For my quick tests I did not get that many hours of power, but taking into consideration that this was only a demo model and that battery life varies with settings, usage, and other factors, that is to be expected. 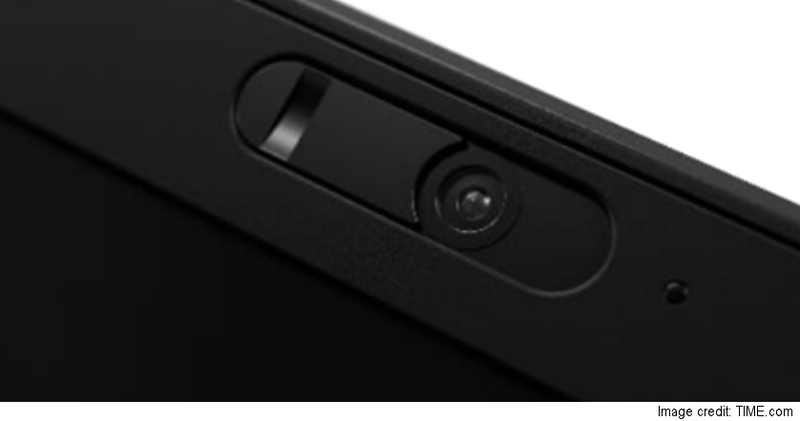 *Note: It is my understanding that the T480s is also available with ThinkShutter, a new convenient feature that allows the user to manually cover the camera in order to achieve webcam privacy. If you intend to order the T480s with ThinkShutter, confirm that your order includes that. Disclosure: Lenovo sent me the ThinkPad T480s and Pro Dock as part of the Lenovo Community Advocates Program and did not provide additional compensation. All opinions are my own. A few weeks ago, I was the recipient of a ThinkPad 13 Ultrabook in the traditional ThinkPad black color. I’m like a kid on Christmas Morning when Lenovo sends me review units. Out of the box, I noticed the ports. 3 USB ports is definitely a plus. 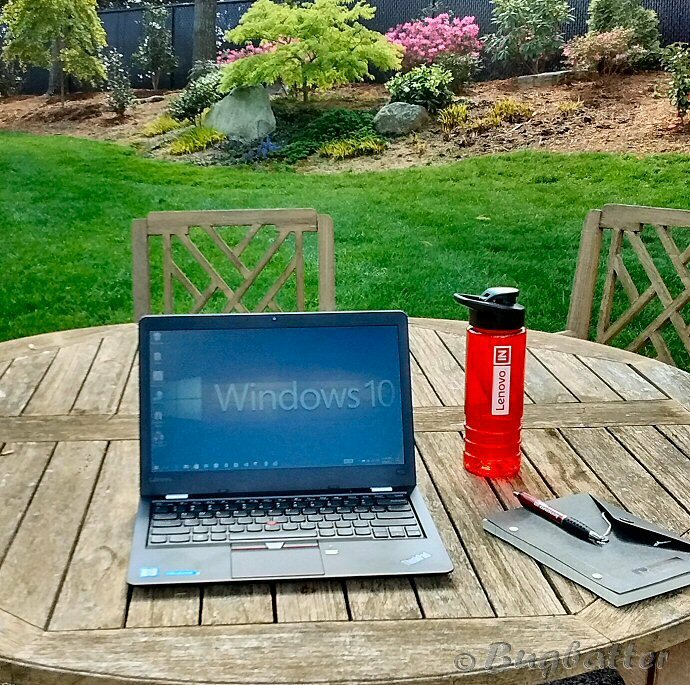 I’m not in the military, but I have been putting it through the paces in my outdoor office area. I was disappointed that the ThinkPad 13 has no backlit keyboard, but considering that it is a budget laptop that is understandable. However, its comfortable, responsive ThinkPad keyboard and other features are a plus, so I can overlook the lack of backlighting. As to my personalized setup, I chose to install 2016 Office Professional Plus, rather than using the trial or activating the Student & Home edition that had been pre-installed. Windows 10’s resident Defender along with Malwarebytes Pro 3 have been doing well for me on my other Lenovo products, so I decided to stay with those and a few other small security applications. Now that we have OneDrive, transferring personal files has been a breeze. Lenovo has advertised that the ThinkPad 13’s battery will provide up to 11 hours of power. I was able to work for 9+ on a single charge. That’s still amazing. The fact that this ThinkPad is a “Signature Edition” saved me from having to remove some of the extras that I don’t need. 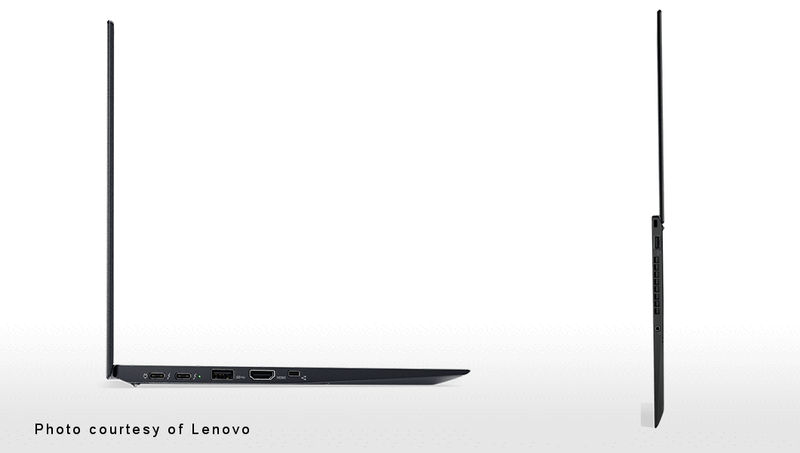 At this point Lenovo Companion is still included to help with system information, hardware scans and software updates. However, while Companion may be a convenience for owners I had to deal with popup notifications requesting that I enter Lenovo’s Rewards program. While some folks may like that, in my case, I opted to disable notifications via Windows 10 settings. In addition to the Rewards popup, Companion’s “Discover” feature showing various accessories, may seem to some users to be a bit like adware. I am hoping that Lenovo will rethink those components in the future. I noticed that one of the Lenovo Shopping pages shows that the ThinkPad 13 is sold out. I hope that is only temporary because it’s been a great little ultrabook during my use. Even though the ThinkPad 13 was introduced in 2016, it still measures up to the needs of business users – commuters, especially. If you are fortunate enough to have one, you are a lucky person. For the price it has great performance, features, and reliability. Disclosure: Lenovo sent me the ThinkPad 13 as part of the Lenovo INsiders program and did not provide additional compensation. All opinions are my own. Several weeks prior to CES 2017 Lenovo sent me a pre-production ThinkPad T470s to review. The T470s arrived with a Signature Edition of Windows 10 Pro installed. Signature Edition PC’s are those without programs, toolbars, utilities, and screensavers that may be unwanted by the customer. This has been referred to by some as “bloatware”. 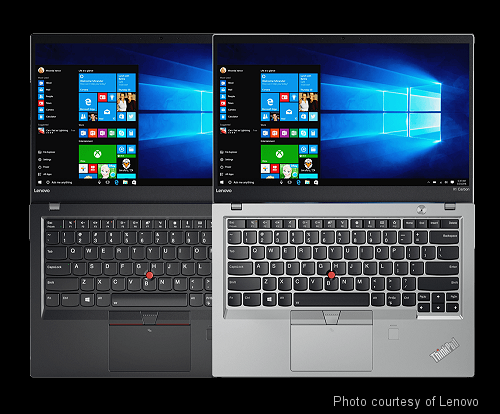 Instead of Lenovo’s installing time-limited free trials for third-party software a Signature Edition results in a cleaner, faster experience for the customer. This also applies to an antivirus solution because the Signature Edition PCs ship with Windows Defender, Microsoft’s own antivirus/antispyware software that is included as part of Windows 10. A couple of new features on the new ThinkPad are its processor, a 7th Generation Intel Core i5 “Kaby Lake” 7200U, and a Thunderbolt 3 port. 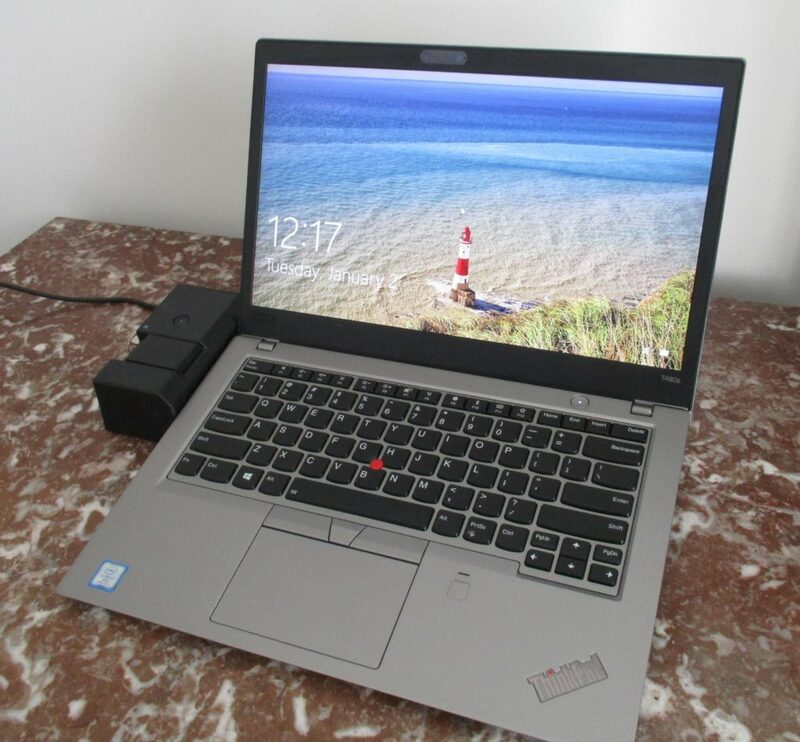 The unit that I received for testing was without some of the optional features such as backlighting for the keyboard and a touchscreen, but all things considered, I was still able to experience the excellent T470s portability and performance. The T470s is perfect for business users who work on the go or for times when they take time off to enjoy music and movies. Mobile users who regularly work out of the office, having to rely on cloud services and portable devices will enjoy the T470s. 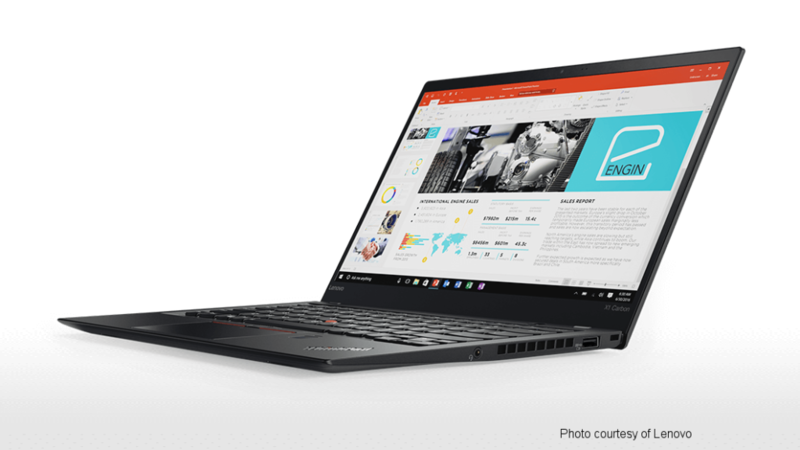 With its fast LTE-A (4G) connectivity, if they are out of WiFi range, the T470s is easily able to access cloud data and apps. 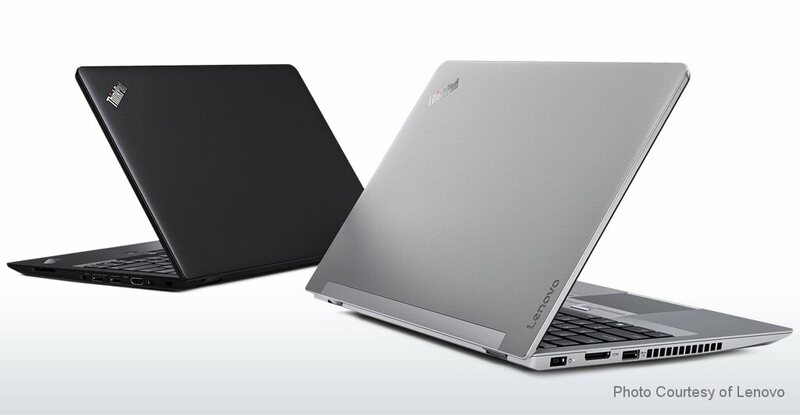 Lenovo gives users a choice of a silver or black exterior. The one I tested was black. 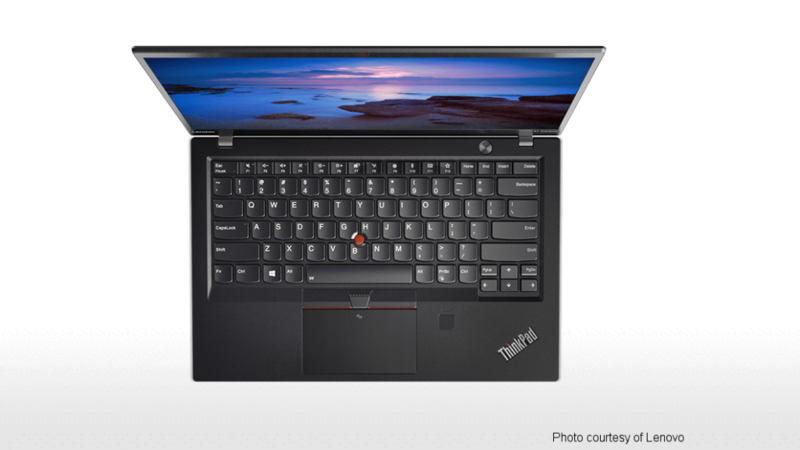 People who are diehard classic ThinkPad users may need to get used to Lenovo’s modern keyboard. These Kaby Lake ThinkPads have a so-called “Precision Touchpad”. New users will find the modern keyboard and trackpoint with accompanying trackpad easy to use. Pictured above are the sides showing the ports. 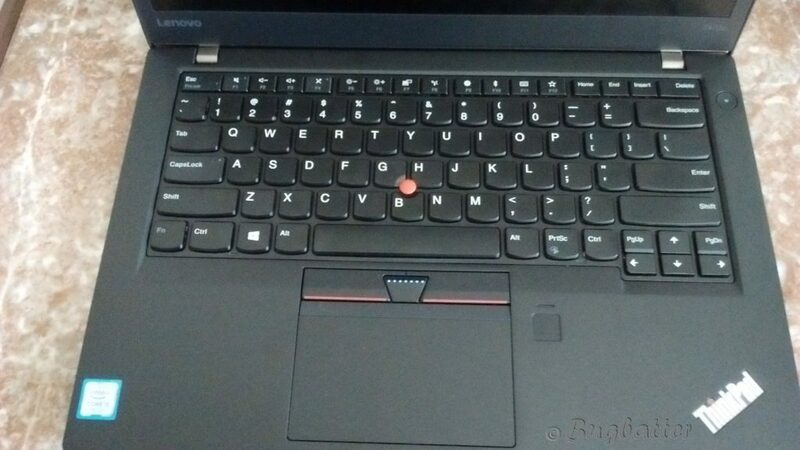 I was glad to see that ThinkPad kept the “Kensington” type slot (not shown) on the right side. In addition to that, notice the array of ports: two USB 3.0 ports/ HDMI port /3.5 mm audio jack/ Ethernet port / SD card reader / Smart Card reader as well as the Thunderbolt 3 port. 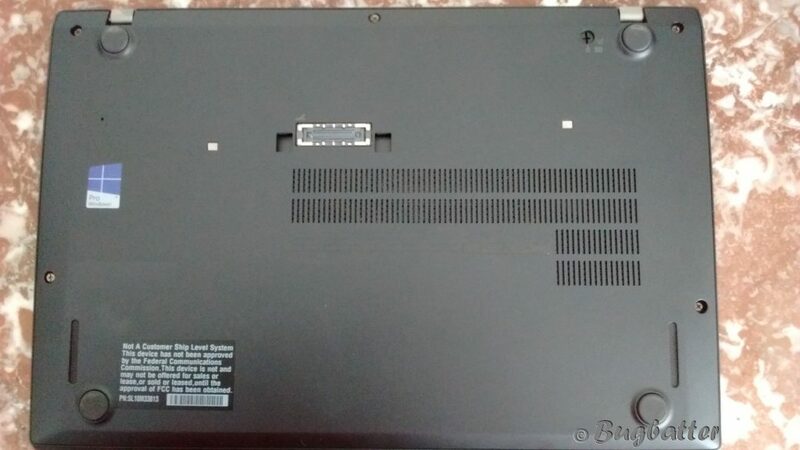 As the image of the bottom of the case shows, there is ThinkPad’s “emergency reset hole” on the left and center, a “Power Bridge” . 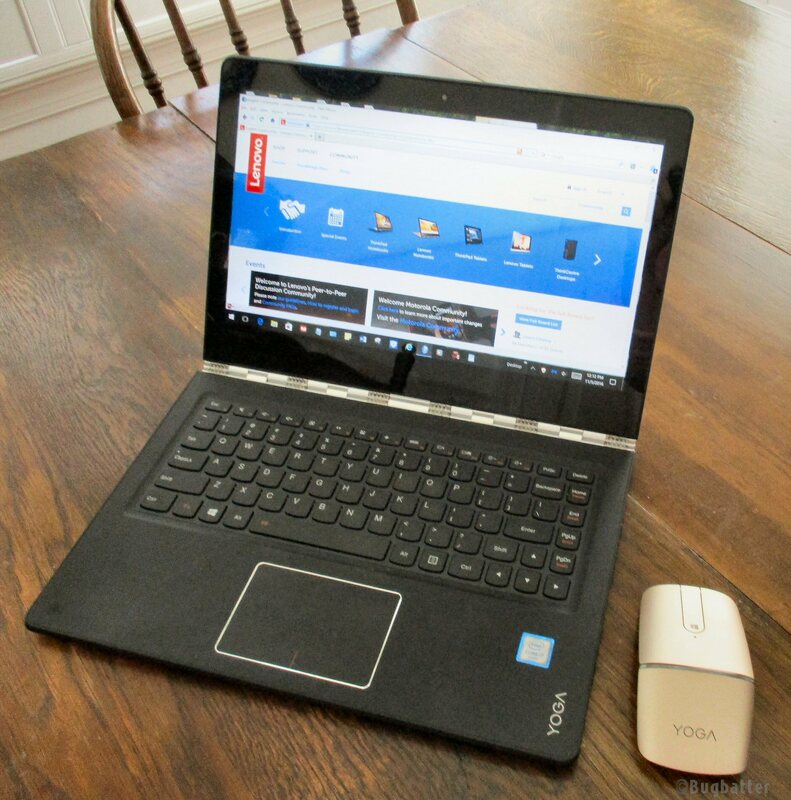 After I received a YOGA Mouse for testing I was inclined to title this review, “If You Give A Mouse A Cookie”, but that one has already been taken so I had to come up with something else. Nevertheless, I’ll do my best to relate my journey with YOGA Mouse on YOGA 900 and ThinkPad Helix – both running Windows 10 Pro. 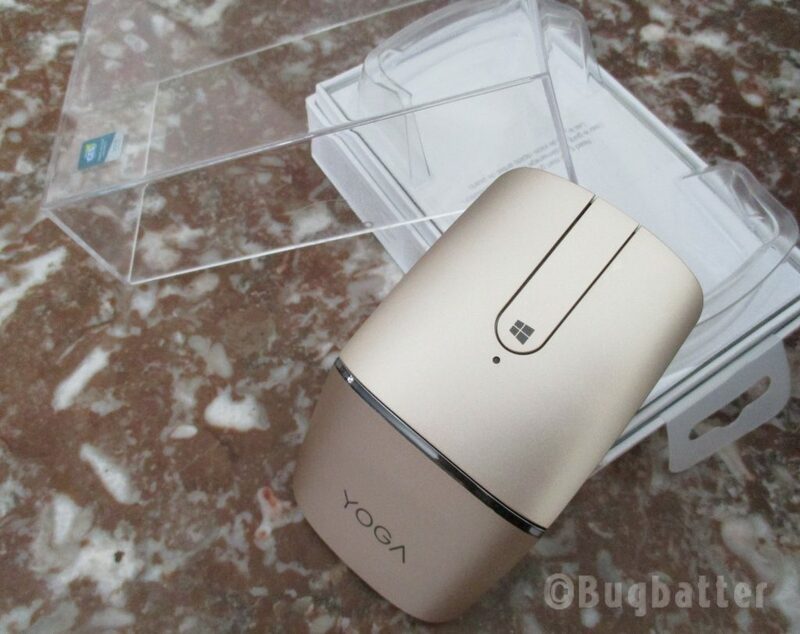 When the YOGA Mouse arrived in its beautiful presentation box, it was easy to notice how nicely it would coordinate with my champagne gold YOGA ultrabook. It took me a few minutes to figure out how to free the device from its packaging though, but once that was accomplished the mouse was ready for charging. 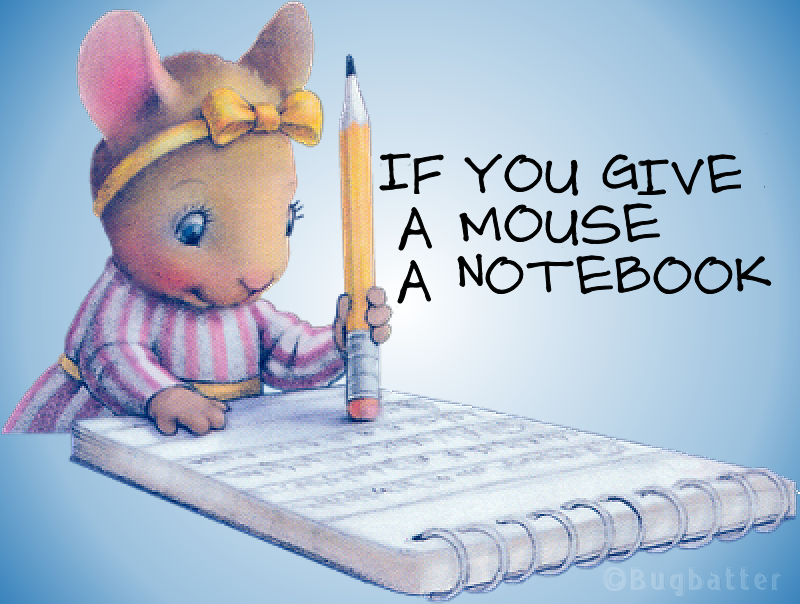 One plus for the mouse is that no batteries are needed. 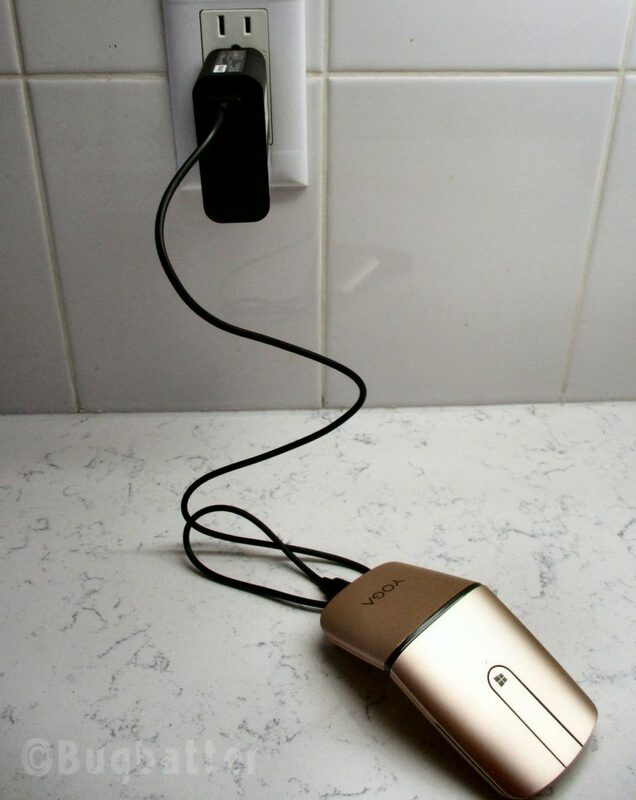 According to instructions provided in the Quick Start Guide, the Yoga Mouse can be charged using the included USB charging cable. However, for the new user it is not clear exactly how to accomplish this. One assumes that it is to be connected to a computer. All of my USB ports were occupied at the time, so I experimented with using the regular wall charger/adapter provided with my Yoga 900 ultrabook. That seemed to work. Charging took about an hour. After charging and pressing the ON button, I had several options: Wifi mode, Bluetooth Mode, PC Mode, and Presentation Mode. I tried Wifi mode to make sure the receiver was working. Worked like a charm! However, I feel that for traveling, for many users Bluetooth is the most convenient. I replaced the receiver back to its notch inside the mouse and got busy pairing YOGA 900 and YOGA Mouse. I worked for an hour or so on the initial charge, but re-charged in order to be ready for the next day. The following day, I decided to try my hand at creating some November-December theme watchfaces for the Moto 360 watch. That went well for about an hour, but the mouse stopped responding before I was finished. I am not sure whether that was because of the online Facer application, or whether there was a disconnect between mouse and computer. Since then I have had a mouse disconnect while using Facebook chat. On the other hand, when in Wifi mode with the receiver (as opposed to Bluetooth), the YOGA mouse was quite quick and responsive. I’ve been using it in that mode for my artwork and fast-moving chat since then. When I used the mouse on my ThinkPad Helix in both Wifi and Bluetooth modes for hours there were no disconnects. YOGA Mouse seemed to fly along with a rapid response to whatever the task at hand. Lack of detailed charging instructions in Quick Start Guide. There is mention of what to do, but the “how” is missing. Bluetooth Mode had trouble staying connected when used with YOGA 900 / Windows 10 Pro. The fact that the YOGA Mouse can be recharged, is an outstanding feature. That combined with the fact that it is compact and light makes it a good choice for business travelers and casual users.